The trucking industry is looking at a new tactic in the battle to alleviate the ongoing driver shortage problem. 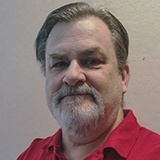 The problem, according to a recent release from the Commercial Vehicle Training Association is that long delays in some states' CDL testing programs are resulting in almost a quarter million potential drivers annually having to delay their entrance into the driving workforce … or, they give up entirely and take other jobs. The "hook" planned to be employed by CVTA to turn this issue around is to persuade Congress to recognize the economic impact of these delays. Toward that end, CVTA commissioned NDP Analytics to perform a study on the economic impact of CDL licensing delays resulting in state testing policies. Federal law already mandates that there be a 14-day waiting period between when a potential commercial driver passes the written test and when he or she can take the driving skills test. But the problem that CVTA and others wish to address stems from the wide disparity in actual longer wait times to schedule those tests. Those extra wait times can be from zero days to several weeks, if not months; with corresponding economic consequences. A FMCSA survey found that in 30 states there was no wait time to schedule a test, but that in 16 states those delays ranged from one day in Arkansas and Minnesota up to 47 days in New Jersey. The problem compounds, however, when students must retake the test – as 29 percent must do – and the wait times to reschedule can run several more weeks. What the consulting firm study discovered is that the states with no scheduling delays allowed third-party testing for CDL skills tests. So they aimed their investigation at comparing the economic impact for states without third-party testing -- and thus long testing delays -- to states that employed third-party testing. In the chart Table A1, it is reported, for example, that California had fewer initial tests for the period studied, compared to Florida -- 50,174 in California, compared to 69,926 in Florida. But the big difference is in the wait times resulting in delays. 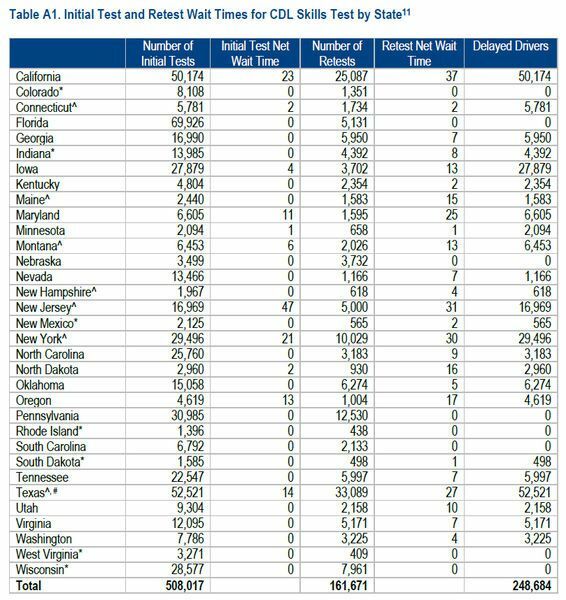 California had an initial testing wait time of 23 days, and a retesting wait time of 37 days. That compares with Florida's zero wait times in both categories. The reason? Florida has 200 sites capable of doing the CDL testing, and California has just 23. As shown in the chart Table A2 the impact of this difference is staggering. In California, those 50,174 drivers were prevented from entering the driver workforce in a timely manner. 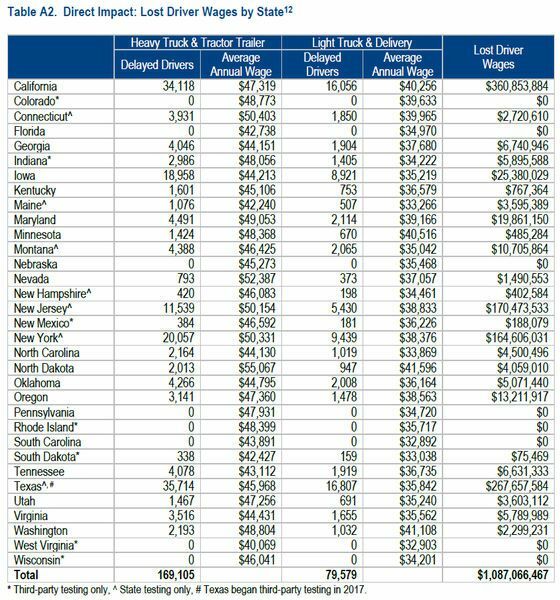 Here's the staggering part – Those California drivers experienced some $360 million in lost wages because of the delays – compared to no lost wages for new Florida drivers. This is an economic impact that spreads out to the economy because those drivers are not spending their paychecks, and government entities are losing the tax revenue. Taking all of the states that have long delays in testing times, the economic impact from drivers' lost wages is more than $1 billion a year – and it only exacerbates the driver shortage. “The real problem is the way it impacts students,” Lefeve said. “You wait six weeks to take a test, and then you fail, and now you have to wait another six weeks to get tested again." That results in many ending up taking other jobs; which just adds another driver to the driver-shortage statistic. Armed with this quantifiable information, LeFeve says the solution is to turn to Congress for legislation mandating states to maintain wait times not exceeding seven days. That would encourage states to turn to third-party testers. Legislation was introduced into the House of Representatives last year, and LeFeve said he is hoping it will be re-introduced by this year's House.